I have Lillet to make Vespers. I have Gordon’s gin to make Vespers. After all, Bond is pretty specific when he calls for Lillet and Gordon’s, so I figure I should use the ingredients he stipulates. I had always considered that the Lillet was like vermouth and wouldn’t be good to drink on its own. But for our Valentine’s dinner this year, I cooked a three course meal for my wife, and served the first course with glasses of Lillet on ice. Lillet is actually a wonderful aperitif wine that is sweet and fruity. 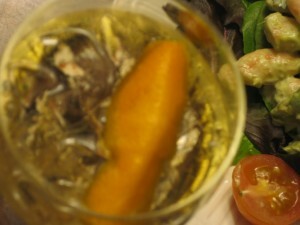 With a slice of orange in it, it has an amazing orange nose that goes well with salad. We had a shrimp and avocado salad with a light mayonnaise dressing, and the Lillet complemented it perfectly. On ice, the Lillet became watered down a bit, but I don’t think it hurt the drink. In fact, it may have made it better. The original Kina Lillet (so-called because it contained a lot of quinine, and Kina is the plant from whence comes the malaria medicine) was supposedly much sweeter and syrupy, and this is the stuff that James Bond called for in his Vesper. The original recipe was also more bitter because it contained more quinine. After all, the aperitif category itself was developed partly as a way to combat malaria (here’s looking at you, Dubonnet! ), so it had a lot more quinine back when it was first made. By 1986, when the recipe was changed, I guess the quinine content wasn’t as necessary. The more refined version that exists today is a good, sweet wine that works perfectly with appetizers, anytime before a meal, or even on its own as a nice, outdoor, summer drink. Alcohol Reviews assessment of Lillet is right on except I think it overstates the amount of bitterness in the drink. The bitterness comes from herbs (kind of like the alcoholic additive known as bitters), so it’s a very subtle kind of bitterness that turns immediately to honey. If you’re not careful, it’s as if the bitterness isn’t even there, and it is merely the taste of honey and orange that takes over. What I do agree with is his assessment that this is a good aperitif wine that deserves to be drunk on its own.